Consumables are something that keep your lab instruments running smoothly, and in most cases, you couldn't conduct an analysis without them. Here at LECO, we offer our own line of consumable products that go hand-in-hand with our instruments. 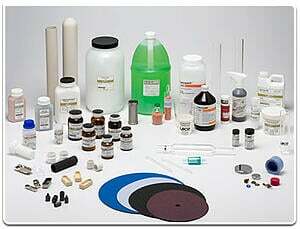 Why buy LECO brand consumables? What it comes down to is quality. Only LECO consumables are designed and tested by our engineers to work perfectly with our instruments and provide the best performance possible. Though off-brand consumable are available, they won't provide you with the same benefits. To put it simply, you'll get more out of your LECO consumables; from better quality and accuracy in your results to full customer support, answering any questions you might have along the way. We support your success, and authentic consumables are part of helping your lab succeed. LECODirect, the exclusive online ordering site for LECO Consumables, gives you the power to easily shop our products and make an online order. You rely on LECO instruments to provide the results you need, and LECODirect will help you streamline your ordering process, so you will always have the consumables, standards, and spare parts you need to continue analyzing your samples and getting results you can count on. LECODirect was designed for you, to make your lab life simpler and your ordering smoother. Sign up for an account now! LECO Direct is currently available for U.S.A. consumable orders only.